A slow growing broadly rounded shrub. 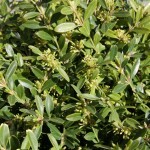 The attractive, bright green foliage becomes rich olive in the winter. Considered one of the hardiest boxwoods. 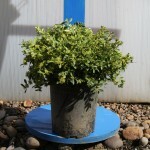 Good for foundation plantings or low hedges. It has a surprisingly sweet fragrance in very early spring, on inconspicuous flowers. It grows in well-drained soils in sun to part shade. Prune if needed for form.